Episode nine was filmed in the “Mars” exhibit. In this scene, alien Brad is feeling very homesick. Miss Friday starts the scene talking about the Mar Rovers, and alien Brad makes a bad joke about rovers breaking Martian traffic laws. Miss Friday continues the conversation, and then alien Brad’s attention wonders off, with him thinking back about how wonderful it would be to be back on Mars. Then alien Brad makes a big mistake. He takes a meteorite from a display table and takes a deep breath in, smelling it, helping to remind him of Mars. But finally, finally, Miss Friday finally adds 1 plus 1 and realizes that alien Brad is not really Brad, but the alien. It has taken her all this time before she has come to this realization. Part 2 of Question 8—The follow up to the question. Episode eight is another Friday task-related question. On the previous Fridays, I wasn’t involved in any of the scenes. But on this Friday I performed my longest dialogue of all the episodes, although you never see my face. That’s great, because I didn’t have to memorize any lines. All I had to do was read them. Episode seven is filmed at the “Animals in Space” exhibit at the Roddenberry Launch center, and alien Brad is becoming more comfortable in his human skin, although he thinks he is better than he really is as he impersonates the real Brad. The scene starts off with alien Brad pointing out the various animals that have been sent to space. He is a little awkward in his movements, he appears to have some new boils on his neck, and his knowledge of Earth animals is not the greatest, but Miss Friday is still none the wiser. If you are a DBA in Space fan, and in case you missed them, there have been two items published on Simple-Talk.com that you may be interested in reading. 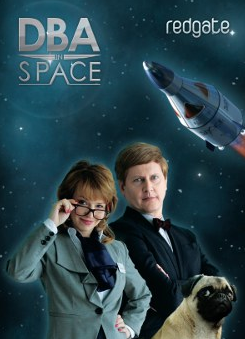 The first is “Stars of the DBA in Space Webisodes Revealed”. This is a spoof interview where Miss Friday and I are interviewed by Bob Cramblitt, and we respond as our characters in DBA in Space. While Bob asked the questions, Nell Mooney (Miss Friday) and I provided the actual answers. As you read my responses, try to figure out which information I share is real, and which is fake. You might have a hard time figuring out which is which. The other item is called “The DBA in Space Videos: A Film Critic Writes”, which is written under the pseudonym “Hugh Bin-Haad”. I won’t tell you who Hugh Bin-Haad is, but if you read Simple-Talk a lot, you will figure it out. While Hugh Bin-Haad put a lot of effort in analyzing the webisodes, I kind of think he missed the underlying symbolism the webisodes actually portrayed. Both of these are fun pieces to read if you have some extra time to kill. Episode six is filmed at the “Visions of the Future Exhibit” at the Roddenberry Launch center, and it is time for another question for the DBA in Space Competition, so Miss Friday and alien Brad are ready to offer up the question. As you may notice in this scene, alien Brad seems to be a little more comfortable in its new skin (which also seems to be turning a little green) and is learning how to speak a little better. On the other hand, he still doesn’t have any street smarts, not quite realizing that his job of pretending to be the real Brad is not really working out all that well. On the other hand, Miss Friday is still clueless as to why Brad is acting so odd. She still hasn’t made the connection that Brad is really alien Brad. Part 1 of Question 5—The question. Part 2 of Question 5—The follow up to the question. Episode five (the longest of all the episodes) aired on a Friday, so that means it’s time for another task-related question from Miss Friday. I don’t appear in this episode (other than on the cover of my book), but another actor does. I never got his name, but he is a comedy actor based out of London. In this particular episode, Miss Friday, in her Verity Blunt persona, thinks she has captured the alien, who just happens to be the Roddenberry Launch Center’s DBA, the DBA identified during the previous Friday’s episode. With each episode, DBA in Space becomes goofier and goofier. Episode four is also set at the “History of Computing Exhibition”, as the previous episode, but from a slightly different angle. At the right side of the screen you can see an Osborne 2 portable computer. I used to sell these many years ago at a local Computerland store in Springfield, MO, for $1,995, which included a free copy of dBase II, among other software.